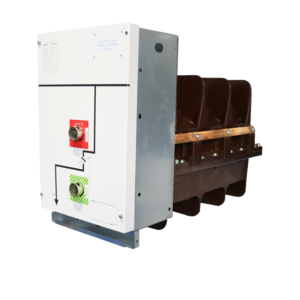 Three-phase three position load break switch RV 50 of the class E3, M1 according to IEC 62271-103, 17,5 kV – 630 A – 20 kA and earthing switch with a making capacity of 50 kA. Three-phase earthing switch RV 50 of the class E2, M1 according to IEC 62271-103, 17,5 kV – 630 A – 20 kA, with a making capacity of 50 kA. Interlock between earthing switches and load break switch. Stainless steel tank filled with SF6 at 0.15 MPa. Maintenance friendly and fully integrated load break switch and earthing switches on both sides. Both sides of the unit can be earthed. Sight glasses for the position indication. 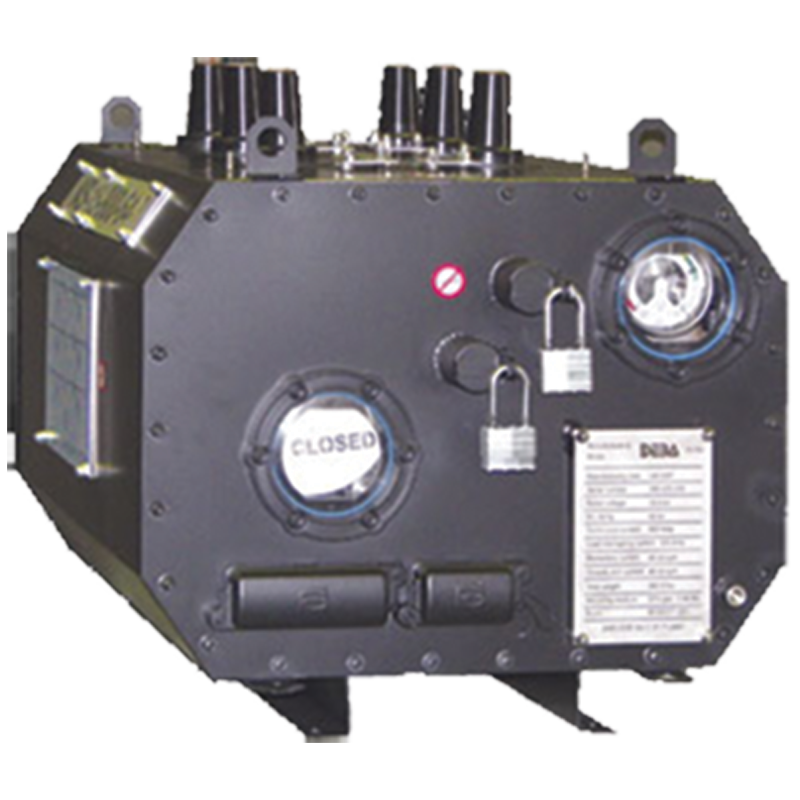 The RV44 load break switch consists of an epoxy enclosure in which fixed and movable contacts are mounted. The switch is filled with SF6-gas (sulphur hexafluoride) and sealed for life. The special properties of the SF6-gas guarantee a perfect insulating and reliable quenching in the housing function. As a result of the ideal switching speed at the switch/drive-mechanism combination, the load-break switch features very short arc times. The patented switching principle combines maximum gas revolving effect with a precise finishing of the electrical contacts. This guarantees excellent dielectrical features and a minimum of contact erosion. The load break switch is a two-position switch that connects or interrupts the voltage between the high voltage cables and the bus bar. The position of the load-break switch is clearly indicated in the single line diagram. Depending on the version, the load break switch is operated manually or electrically. See Drive Mechanism. Manual operation is carried out by means of the supplied operating handle. The three-position switch RV50 (on/off/earth) is tested in accordance with IEC standards. The concept ensures a natural interlock (open, closed, grounded) of the primary functions of the cubicle. A short bow time by optimizing the speed of the mechanical drive and a patented combines with a SF6-gas rotation and electrical contacts for the extinction of the arc. Our experience with the RV44 switch from the DF-2 range, finds a perfect application here. The switch is of the class E3/M1 (100 CO and 1000 mechanical operations) according to IEC 62271-102. 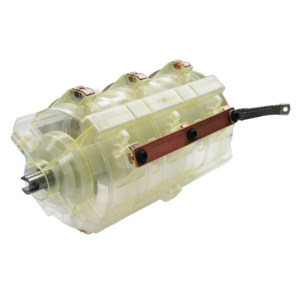 The RV53 is a with SF6-gas-filled, 3-phase (in/out/earth) load-break switch of the E3 class according to IEC 60265-1 to 24 kV – 630(A) – 20 kA. It is a product for integration in locally manufactured switchingdistribution and control apparatus (OEM) with the matching mechanical drives. 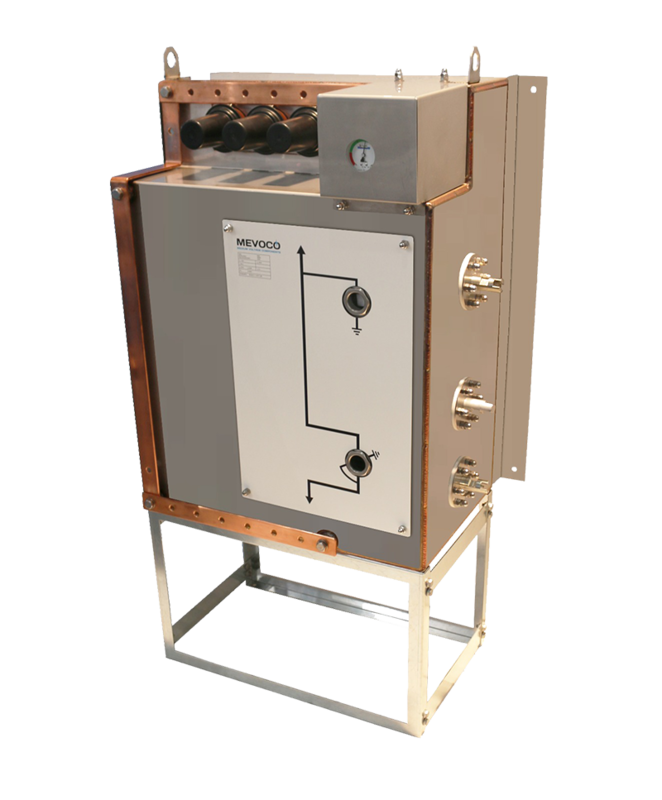 RV53 is a three-position SF6-gas insulated “sealed for life” load break switch with integrated earth. Its “built to last” design with double seals is maintenance free. The concept is safe and robust. 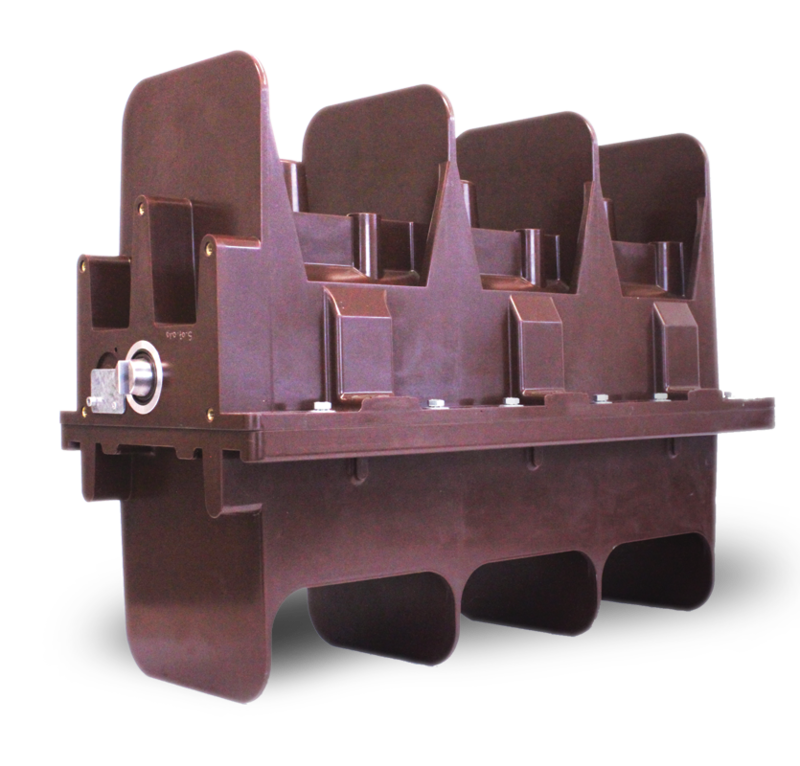 It is focused on reliable operation during the full life time of medium voltage switchgear. It features an integrated earth. The switch enclosure consists of two half-shells in high quality epoxy material. The shell design features isolating epoxy walls that protect phases from flash over. 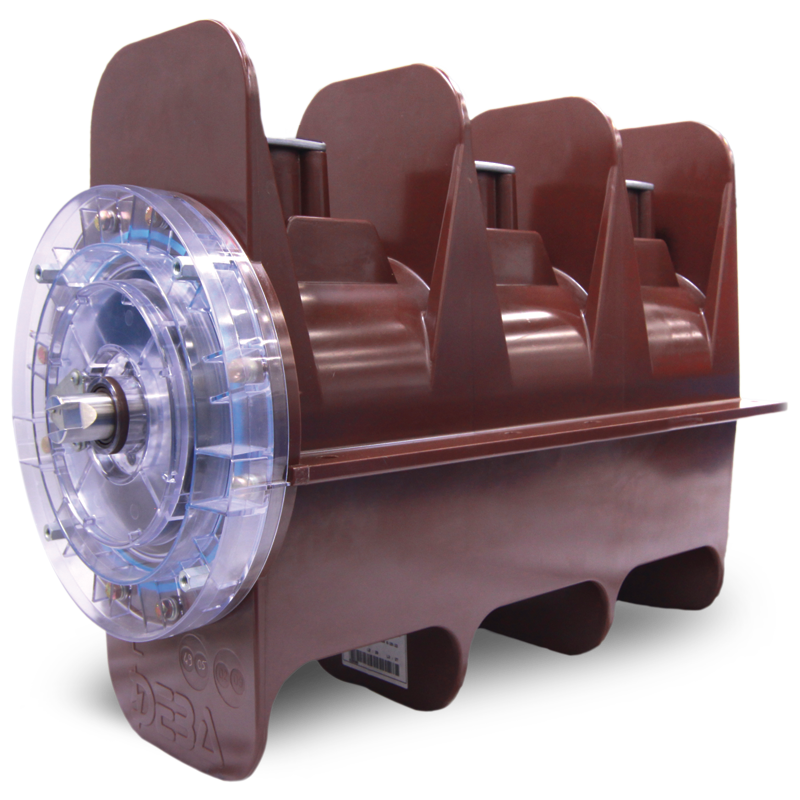 Its ability to be totally immersed (tested on water column 7 m) makes the RV54 perfectly usable in installations where there is flooding risk. The load break switch is ideal for separating and sectioning off power to select parts of your network. hold current of 40 k/2 sec. create flow of 106kÂ (5 x C).